In association with Staveley Head, Trucking magazine is looking for the country’s best truck driver – and we need your help! We all know trucks keep the wheels of the Britain turning, ensuring manufacturers can produce, retailers’ shelves are stocked and the national economy stays buoyant. But we reckon the men and women that pilot the vehicles don’t get the recognition they deserve. The hours can be long, the roads can be a trial and the conditions out there on the highway can leave a lot to be desired. So we’re looking to celebrate our country’s drivers by searching for the best of the best to crown our Trucker of the Year 2017, in association with Staveley Head. We’re looking for nominations of drivers who are true Knights of the Road, who go above and beyond the call of duty and represent the very best of the British trucking community. Perhaps they’re always willing to lend a hand; perhaps they go out of their way to help others; perhaps alongside their day job, they’ve worked tirelessly to raise money for good causes. Whatever the reason, we’d like to hear about them. So get your votes in now – and if you nominate the winner, you could win a year’s subscription to Trucking magazine! The driver who is crowned our Trucker of the Year 2017 will win a full day’s 4×4 mountain adventure in Llangollen, Wales, courtesy of Red Letter Days. 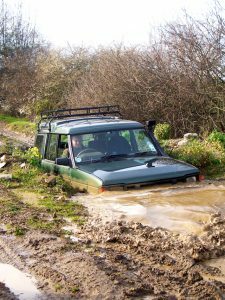 The winner will take the wheel of a tough-as-old-boots Land Rover Discovery for an unforgettable drive along some of Wales’ most picturesque and punishing off-road mountain tracks, tackling hills and ditches, slopes and ruts – you name it. In addition, we’ll throw in a night’s stay for two in a four-star hotel, plus dinner. If you know a driver who fits the bill, please click on the link below and let us know your name and contact details, the name and contact details of the driver you wish to nominate, and the reason why you think they should be crowned Trucker of the Year 2017 (in 100 words or fewer).